Stats show that kids who read throughout the summer have a great kick-start to school in September. And kids who don’t, typically start the school year a bit behind. With the school year ending, now’s the time to plan your child’s summer reading and writing projects. Does your library have a summer reading program? Ours does; it’s usually a large poster with about a dozen stickers you can earn over the summer by reading a book and then telling the librarian what you read. The stickers are motivating because they “add” to the picture on the poster when you stick them on it. It’s also nice for kids to have the undivided attention of the librarian while they’re telling her about the books they’ve read. This would be a pretty simple project to do at home. Instead of a poster, it’s a big picture you or your child draws on bristol board – and a flat of stickers that have some kind of theme. You could also arrange the stickers in a “reading reward chart” configuration. Each sticker represents a book the child has read and when he’s read five (or 10) books he gets a reward of some kind. It’s important to put the poster or chart up on the child’s wall so it’s constantly motivating for him. I don’t know about you, but when my son was small I counted books that we’d read together as well as ones he’d read himself. Both types of reading are equally important and valuable, I think. 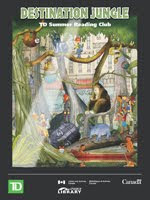 Here’s a link to the Summer Reading Club. This year’s theme is “Destination Jungle” and the image with this post is this year’s poster. I think this is great for most kids. At the moment, my oldest reads so much that charting it would be disruptive to their reading appetite. But, it has worked very well for her in the past! That's great! Yes, for voracious readers, all they tend to need is a library card and then… just stand back! What's your oldest reading right now? Maybe some of our other readers would be interested. That's sound advice. In the UK we have an excellent summer reading initative. Lots of libraries take part, and children are rewarded for reading any book they want. The idea this year is they read 6 books, and each time receive a reward to eventually blast off their space rocket. Great idea, Joyce! My challenge this summer is to ensure that my kids continue to read in French and English. I think that the chart might work just fine.